Andrew Rennhack wore a huge grin as he was mobbed by friends, family and the media moments after he won his first WSOP bracelet and secured an amazing $408,953 for first place. Rennhack fought his way through a starting field of 1,594 entrants to return today to battle it out with the remaining 12 players, and at the end of nearly 10 more hours of poker he was the last man standing. Play resumed on Day 3 at 1 p.m. and Christopher Symesko was the first player eliminated. He lost a big pot to Rennhack in the first hand of play when his lost to and a queen came on the turn. Heinz Kamutzki then eliminated Symesko moments later. Will Failla was out in 11th place and Jonas Wexler fell in 10th. Poker pro Dan Smith was the next player to go from the official final table of nine, dashing hopes of his first WSOP bracelet. Smith was all in with against the of Kamutzki and the board ran out . Eric Rappaport busted in eighth place when his fell behind to the two pair of Reed Goodmiller who held . It all went in on the turn and the final board read . 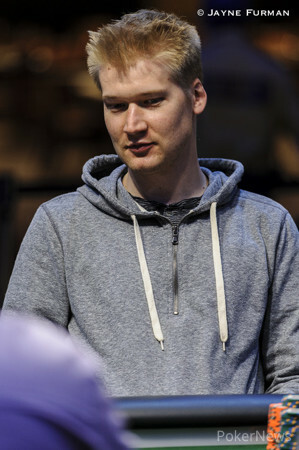 Out in seventh place was Geremy Eiland, who ran first into the aces of Rennhack to cripple him and then the aces of Ryan Welch when he shoved his short stack in the next hand. Six-handed play went on for some time and it was nearly three more levels before Kamutzki three-bet shoved with and was called by both Tony Gargano and Rennhack. It was Gargaro with who would pair his ace to send Kamutzki to the rail. A short while late it was Goodmiller’s turn to get his short stack in with two other players holding and he was bested by the of Rennhack this time. Goodmiller was the fifth placed finisher. Welch went out in fourth when he three-bet shoved with and ran into the of Michael Katz. A final board of sent him packing. Three handed play became a cagey affair but first Gargano asserted his authority picking up pot after pot until Katz started exerting his own pressure after Gargano lost some chips. Momentum swung back and forth and with Gargano getting low on chips he made a move on Katz three-betting him all in from the small blind with but ran into the of Rennhack in the big blind. The queens held on a final board of , leaving Rennhack and Michael Katz to play heads up for the win. Katz went into the final phase of play with a 5:2 chip lead over Rennhack but his attempt to finish him off backfired when Katz opened for 200,000, Rennhack raised to 500,000 and Katz moved all in. Rennhack called with and Katz showed . The cards came out and Rennhack doubled up. Minutes later Katz was all in with against the of Rennhack. A final board of and it was all over for Katz who picked up the biggest cash of his career. A terrific three days of poker ended with Andrew Rennhack a delighted and worthy winner who will no doubt be celebrating long into the night and cherishing the memories of this victory for years to come. Hand #195: Michael Katz limped in and Andrew Rennhack checked his option. The flop was dealt, . Rennhack checked, Katz bet 105,000, and Rennhack folded. Hand #196: Rennhack limped in, and Katz raised all in, Rennhack though for a moment before making the call, putting Katz’s tournament life on the line. Rennhack was ahead and a classic race for WSOP gold was on underway. The dealer fanned out a board and Rennhack faded a turned flush draw and any king or ten to eliminate Michael Katz in second place. Hand #190: Andrew Rennhack got a walk. 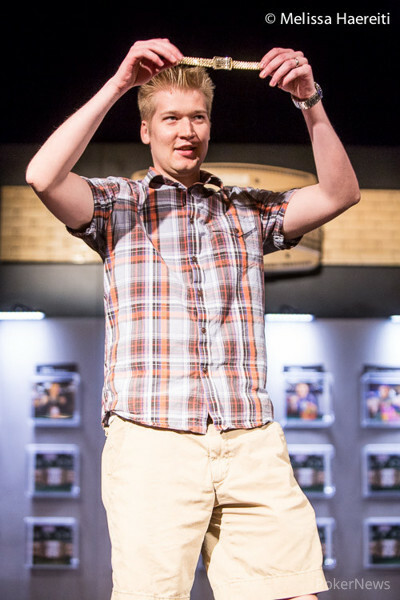 Hand #191: Michael Katz opened for 200,000 and Rennhack raised to 500,000. Katz moved all in and Rennhack called. Katz showed against the of Rennhack. The cards came out and Rennhack doubled up. Hand #192: A limped pot was checked down to the river on a board showing . Rennhack bet 100,000 and Katz called. won it for Katz. Hand #193: Katz made it 200,000 and Rennhack moved all in. Katz folded. Hand #194: Rennhack limped and the flop was . Katz checked and Rennhack bet 150,000. That took it down. called. Dealer dropped a flop of , both players checked to the turn, . Rennhack bet 250,000, Katz called, river , Rennhack bet 500,000, Katz folded. Hand #186: Rennhack opened to 200,000, and Katz called. The dealer rolled out a flop and both players checked. The turn brought the , Katz bet 235,000, and Rennhack folded. 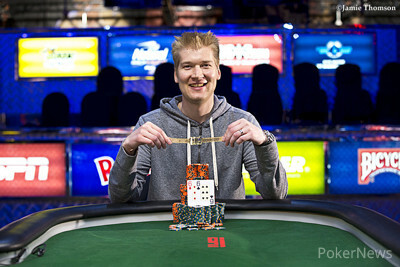 Hand #187: Katz opened to 200,000 and won the blinds and antes. Hand #188: Rennhack opened to 200,000, Katz three-bet to 535,000, and Rennhack folded. Hand #189: Katz raised , making it 200,000, and Rennhack folded. Hand #181: Michael Katz opened to 200,000 and Andrew Rennhack folded. Hand #182: Rennhack raised to 200,000 and took it down. 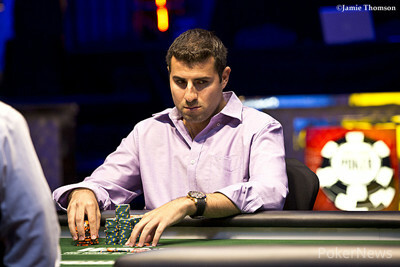 Hand #183: Katz made it 200,000 and won the antes and blinds. Hand #184: Rennhack made it 200,000 and he took it down. The players are on a break for twenty minutes. Hand #180: Andrew Rennhack made it 160,000 and Michael Katz raised to 450,000. Rennhack made the call. The flop was . Katz bet 340,000 and Rennhack called. The turn card was the and Katz thought for some time before betting 555,000. Rennhack called. The fell on the river and Katz checked his cards before moving all in and taking it down.